Wow, I didn’t realize it has been that long without a post from me. What have I been doing you ask? Well just before Christmas, I came up with an idea for a site, and spent the whole Christmas break while I was in Pensacola, jotting down ideas, and drawing up sketches. There are quite a few good sites scattered across the net that gather information and presents them in a neat list. However, I didn’t feel as though they have the same goals that I would with a news aggregation site. First, there is DannyChoo.com. If you have never heard of the site, you must of been under a rock or lost in Akihabara never to be seen again! DannyChoo.com is a huge, and always interesting read about all sorts of Otaku goodness. They have a lot of user activity, but ultimately the main content is a blog from Danny Choo himself. He decides what to show his users. That’s where my site, OtakuStuff.com is going to differ. I believe that the users should determine what deserves to be read, not me. A good example of this concept is Digg.com. The second site that does a pretty good job is JapanSoc.com. I have heard this site’s name before, but never actually read the site until Ken from WhatJapanThinks.com posted an article about it a few days ago. When I heard about it from the article, I had second thoughts about continuing work on OtakuStuff.com. But after looking at JapanSoc.com‘s articles and posts, I realized that we have 2 different audiences. JapanSoc.com‘s aim is to be a site dedicated to social bookmarking for Japan. That’s a larger scope of users than I am after. My goal is to be a place for Otaku to find news that interests them, plain and simple. 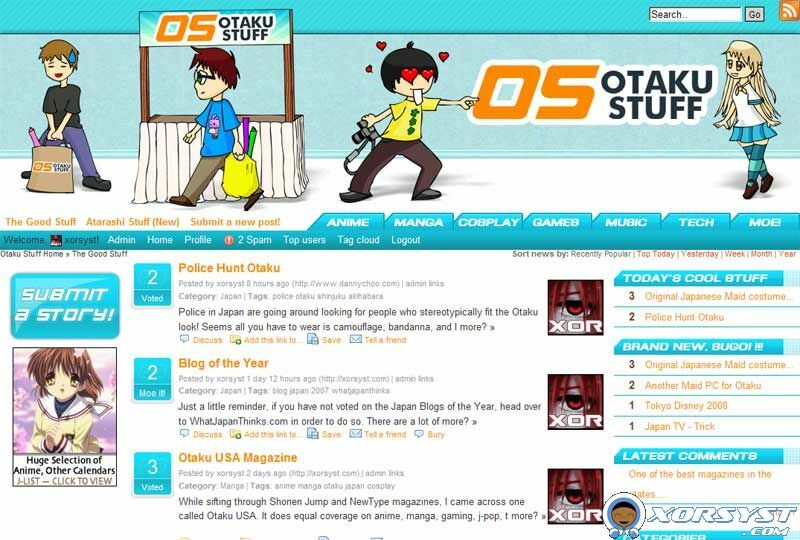 In JapanSoc.com‘s category list, I felt as though OtakuStuff.com could technically fit into their first category, “Anime and Otaku.” As a matter of fact, they only have 1 site listed in that category, so I take it as there isn’t much Ota interest as of yet on JapanSoc.com. I feel as though sites don’t necessarily have to be related to Japan to make it onto OtakuStuff.com. Any new video game, sci-fi movie, or cool piece of tech news could fit into OtakuStuff.com. As I was writing this post, I visited JapanSoc.com and found a link to yet another site, TokyoGraphers, that has decided to close down for the time being due to JapanSoc.com added functionality and size. If those two sites had the same goal, Japan social news aggregation, then I can understand why he chose to close down his site. However, the internet is a pretty big place. Could the world have survived 2 Japan social news sites? Sure! People have different likes and dislikes, and would have chosen which site they wanted to use based upon personal preference. Everyone apologized to each other, but was anyone really at fault? I don’t think so. It was nice to see everyone take it so well though. The Japan niche in the blogosphere has some really nice karma! Well back to OtakuStuff.com. Still a lot of work ahead, modules in development, and ideas in the works. I can tell when I am excited about something, because I will get only about 4 hours a night of sleep and be wide awake in the morning itching to get back to work. I think I will do just that.